Ah, sweetest taste of Spring – Fresh Maple Syrup! Saturday was the perfect day to take a trip ’round Huron County to pick up some fresh, organic maple syrup. I visited Robinson’s Maple Products in St. Augustine and learned all about modern maple syrup production. With 20,000 trees in five separate bushes, Bill and Susanne have built a business that provides fresh organic products not only to much of southwestern Ontario, but also to a large market in Japan and emerging markets in China and the Ukraine. Read the full story at HERE at www.tasteofhuron.ca. This equipment, called a PIG (it looks like one, eh?) churns thickened syrup for smooth creamy maple butter. 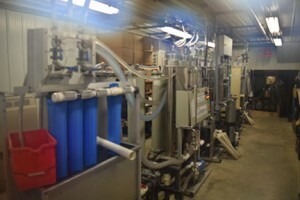 Saps contains 2% sugar, After processing through this Reverse Osmosis System it’s at 16%. Dinner on Saturday night included Tangy Maple Meatballs – a recipe that Suzanne shared with us. Preheat oven to 350. Combined above ingredients and form into 1 1/2″ balls. Please in 8″ square pan, bake for 20 minutes. Combine cornstarch, mustard and salt in small saucepan. Gradually stir in vinegar, maple syrup and water. Cook and stir over medium heat until thickened and bubbly. Drain fat from the meatballs, pour sauce over meatballs. Bake 20 minutes. 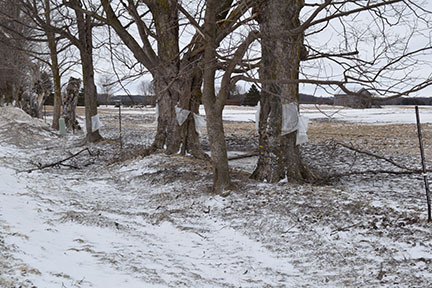 While the Robinson’s operation is automated – sap is suctioned via vacuum on those blue plastic lines strung through the bush the local Amish were tapping trees along the roadside and rather than the traditional pails (shown in last year’s story HERE), they’re using Wine Skins as shown in the photo below. Amish in the area are using WineSkins for sap collection. *Degrees Brix (symbol °Bx) is the sugar content of an aqueous solution. One degree Brix is 1 gram of sucrose in 100 grams of solution and represents the strength of the solution as percentage by weight (% w/w). If the solution contains dissolved solids other than pure sucrose, then the °Bx only approximates the dissolved solid content.